These women all weigh 11 stone according to a story ran by the UK’s Daily Mail. As you can see while they all weigh the same they are not all the same size or shape. When we weigh things we are only interested in that one dimension which is OK if space isn’t an issue but it often is. If you were trying to squeeze these ladies into a container you would need to know something about their shape and how much space they take up to ensure the container you found was the right shape. The density of a material can change with the temperature, especially when talking chemistry and as such that is often recorded also. 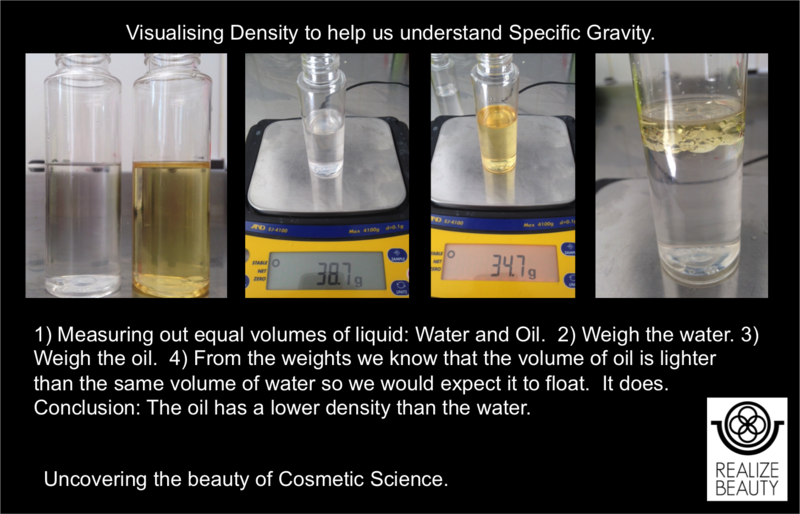 Demonstrating Density with Oil and Water – A cosmetic Scenario. So back to our equation. Specific Gravity is a number that shows us how dense our material or mixture is when compared to water. As it is a ratio it has no units. Numbers less than 1 mean that the material is lighter than water. Practically speaking this means that our material will float if placed in water. Numbers greater than 1 mean that the material is heavier than water. The material will sink. I tried this out with an ointment I’ve made and tested, an SPF cream and a moisturiser. 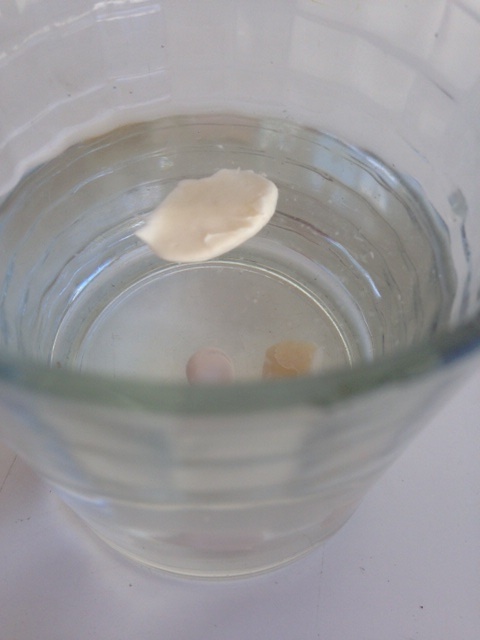 As you can see my moisturiser floated whereas the other two materials sunk. This validated my laboratory test results where I worked out Specific Gravity. I use this equation and visualisation in my daily life as a cosmetic chemist. I watch out for changes in my specific gravity to see if a formula is changing over time. This may help me to detect instability early. I use my knowledge of Specific Gravity even before I make a recipe – to ensure that my oil and water phase stand a chance of being stable. Sometimes I seek to match densities to help build a more stable formula. Finally, as mentioned above I use Specific Gravity to help me to work out what size of container I need and what I will put on the label. I love the science that goes on behind the cosmetic brand and hope that after reading some of these blog posts that you do too! How interesting! I never knew you could even look at it like that.